The Hamilton Bulldogs picked up where they left off before the Christmas break as they extended their win streak to six in a row Thursday night with an 8-4 win over the short-staffed Mississauga Steelheads. The Bulldogs didn’t show any rust early as Mackenzie Entwistle (3) scored on the power-play at 2:14 to take a 1-0 lead. 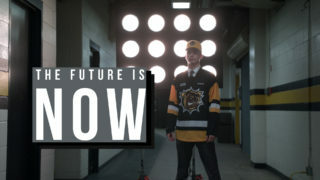 Mississauga gained a little momentum and tied the game at 6:01 only to see Hamilton re-take the lead at 11:48 as Brandon Sageon (17) made it 2-1 followed by newcomer Riley Stillman (2) who scored at 13:03, just hours after being acquired from the Oshawa Generals, to increase the lead to 3-1. The Steelheads got one back late at 18:16 to make it a 3-2 game at the end of 1. Mississauga tied the game 3-3 at the 51-second mark of the 2nd period, but Hamilton got goals from Matthew Strome (18) at 9:07 and on the power-play, Brandon Saigeon’s (19) second of the game at 14:40 to take a 5-3 lead after forty minutes. 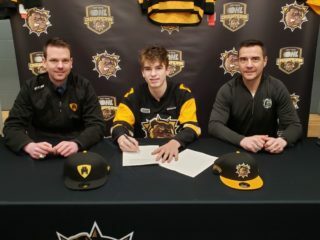 The Black and Gold made sure this one didn’t get away by out-scoring the opposition 3-1 in the 3rd period on goals by Mackenzie Entwistle (4), Connor McMichael (4) and Brandon Saigeon (20) who completed his hat-trick with an empty-netter to make the final 8-4. 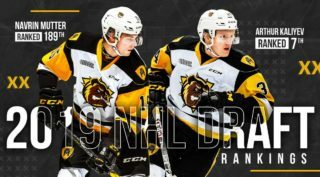 Hamilton is now 5-0 against Mississauga this season. Final shots on goal were 42-30 in the Bulldogs favour. Mississauga goal scorers were Cole Schwindt (7), Trent Fox (11) and Owen Tippett (8, 9). With the win, Hamilton’s season record improves to 22-7-3-3. 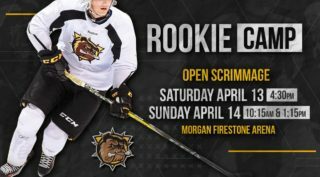 The Bulldogs host the Kingston Frontenacs at FirstOntario Centre on Saturday afternoon at 4 pm. For tickets go to http://bit.ly/2l0Ifor.